At this time of the year, we can feel it if our heater is not functioning well, especially if the thermostat is defect. The thermostat shall keep the working temperature of the engine constant and make the working temperature come quickly. When the engine is cold, the thermostat is closed and the water circulates only in the engine and heater if it is open. When the engine reaches its working temperature, the thermostat will open and the water circulates in the radiator as well. Normally we do not care much for our thermostat, unless it causes a problem. In the good old days, it was common that the thermostat was changed in autumn and in spring. Thermostats come with different temperature settings, as to keep the temperature higher or lower, 82, 88 or 92 degrees Celsius. These are the ones we have chosen to stock, but others are available. For us who enjoy doing it ourselves, replacing the thermostat is a good little job, and it is also something the newcomer can manage. I have just replaced the thermostat on my 4-door saloon. The heater gave only little heat and first thing to check is the thermostat. An 82 degrees was fitted. Now it is replaced with a 92 degrees and it made quite a difference to the heater. I do not intend to replace it in the spring, as I think I can use it all times during the year. The cooling system of a Morris Minor is dimensioned for hot climates as well and in our climate I do not expect overheating as my radiator is in good condition. Next summer, after a longer trip, I will listen for half a minute after switching off the engine. If the engine is close to boiling, I will have a warning. The water will start boiling shortly after switching off the engine. When the engine is switched off the heat from engine block and cylinder head will be transmitted to the water and it will boil for a short time. Of course the radiator cap must be OK and keep a certain pressure in the system, meaning that the water will be more than 100 degrees Celsius before boiling. It can be difficult to judge the performance of the thermostat as the common reason for failing is that the thermostat does not close when the engine cools down. This means, that it will take a long time until the engine reaches its working temperature, but we may not notice this during summertime as we then do not use the heater. When the thermostat is working properly, you can feel warm air from the heater when you have been driving a hundred meters and that there is full heat from the heater after 2-3 kilometres. Thereafter the heat will increase only little. After 20 to 30 kilometres the gear lever will be burning hot. It is not just about heat and comfort. It is also very much about economy. The sooner you reach working temperature, the lesser wear and tear on the engine, especially pistons and cylinders. The higher working temperature, the better fuel economy and smaller pollution. Under certain conditions, it is really something you can feel on your wallet. The job of replacing a thermostat is straightforward and no special tools are required. A screwdriver for the radiator hose clips, a 1/2" socket or spanner and in case the outlet pipe from the heater is blocking your access to the outlet elbow, a 9/16" socket and a torque wrench. In this case you have to undo two nuts for the cylinder head for moving the pipe. The torque wrench setting for the cylinder head nut is 5,5 kg. = 40 lb. ft. Should you not have a torque wrench, we sell a good quality at a fair price. Rarely you will need a hammer and chisel, but the water outlet elbow can be so tight to its studs that it is impossible to loosen it without violence. But better face the trouble now than later when you are not prepared. Should the thermostat block and cause your radiator to boil on a holiday trip, this is no problem if it is easy to remove the thermostat. Before I fit the water outlet elbow, I will apply some copper grease to the studs and for a long time it will be easy to remove it. 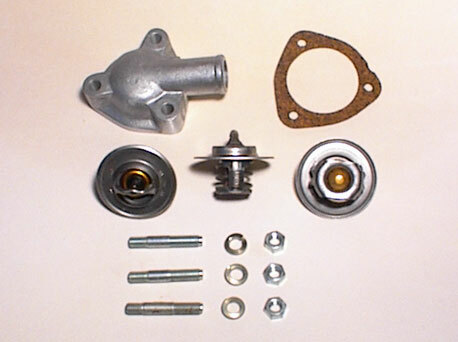 The cost of the parts is affordable, but do ask your supplier about the quality of the thermostat. Some cheap ones not always functioning properly are available. This is written especially for the Morris Minor, but it is more or less the same for all BMC cars. Have a good time and enjoy replacing your thermostat. The thermostats look the same, but the figure for the degrees is always stamped on it.